I'm considering going all the way across to Halifax, Nova Scotia, but am having trouble finding information on getting from there down to the USA (Boston in particular). I gather it's 22 hours by train back to Montreal, and then I could bus down, but the train is only every few days. I've tried Megabus and Greyhound but both sites won't show me how to connect to get to Boston in the USA, for example. Is there a Greyhound connection to the US, or another bus company? Or do you have to backtrack all the way to Quebec/Montreal and cross the border there? There seems to be another way that would require you to hitch-hike for a part of the trip (but you cross the border by yourself). Going with Maritime bus, it takes a bit more than 7h, with one morning and one afternoon bus (leaving at 7am and 12pm). Here is the tricky part, going from St John to St Stephens, located near the border. The distance is a bit more than 100 km. I honestly don't think it will be so hard to find a ride (well unless you go with your family or carry a large volume), in Canada I heard it is all right (and my little experience confirms this), and as of New Brunswick, the language might be the trickier part, so learn some French :). You arrive in St Stephens, a border town, and you can literally cross the border by walking. As you would cross by yourself, you don't take the risk of a driver refusing to cross with you. On the American side, the border town is Calais, ME. Now, from Calais to Bangor, you can use the west coastal connection (with a nice website :) ) which runs one daily bus in the morning. It will take you less than 4h for this part. Arrived in Bangor, you've pretty much done the job. The buses to Boston leave unfortunately either very early morning (5am) or late morning (11.30am), so you will be forced to stay there. It takes less than 6h for this trip. 32 hours and 5 minutes, all the way by train. This is likely the most comfortable option, in particular if you book accommodation on the train. It's probably the more expensive alternative. 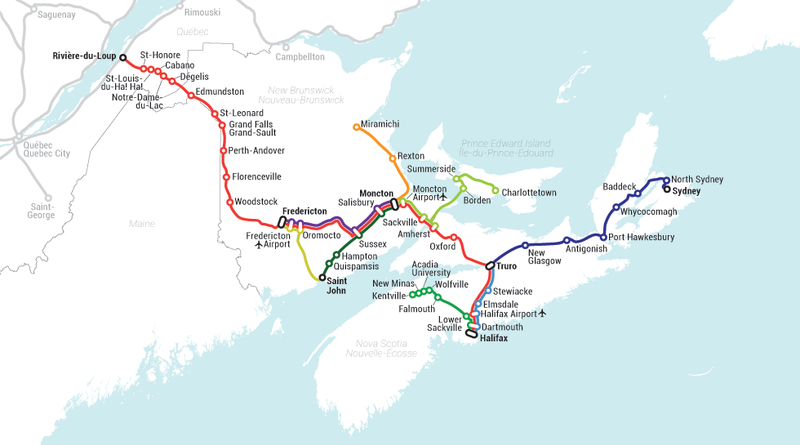 Via Rail operate the Ocean from Halifax to Montreal, departing 12:30 on Tuesday, Friday, Sunday, arriving at Montreal at 8:29 the next day. The Adirondack departs Montreal 9:30 daily, arriving at New York at 20:35. 32 hours and 55 minutes, by bus, taxi, and train. Probably the cheapest option. If you take a 16 mi / 26 km taxi ride from Woodstock to Houlton, the journey is 703 mi / 1132 km. The alternative via Montreal is 1088 mi / 1751 km, so you cut off almost 400 mi / more than 600 km with a short taxi ride. I haven't checked the exact prices, but this is likely the cheapest option, depending on the accomodation you select for the night in Houlton. Route map for Maritime Bus. Source. Either 7:05 – 15:25 or 12:00 – 20:55. From here, it's 16 mi / 26 km to Houlton, ME, USA: 12 mi / 19 km on the Canadian side, 4 mi / 7 km on the US side. From Houlton, ME, USA, travel by CYR from Houlton to Bangor, 8:20 – 11:10. See bus schedule: 1, 2. From Bangor, Greyhound Lines has a bus line to Boston, 11:30 – 17:00, via Augusta and Portland. It passes through Portland at 14:45, so you might consider changing from bus t otrain there. Unfortunately, Amtrak Downeaster departs Portland at 14:35, so this connection fails, and wouldn't gain any time, as the Downeaster arrives Boston 17:05. From Boston, connect to New York either by train or by bus. For example, the Acela Express departs 17:20 and arrives 20:55. If you miss this train, there are still trains at 18:45 and 21:30. I don't know about the specifics of international taxi crossings; you may have to take a taxi to the border, pass the border, and take another taxi on the other side. Should be of interest for a question of its own. Since May 2014, there is again a ferry between Yarmouth, NS, and Portland, Maine. There doesn't appear to be a formal bus service between Halifax and Yarmouth, but there are private shuttle services. I've quoted one below as an example, but have not ever used them and am not endorsing them. Halifax - Yarmouth $75, Bernies Shuttle service. Then you can take the ferry between Yarmouth, Nova Scotia and Portland, Maine. You can book it on http://novastarcruises.com. From a quote I tried, it starts in June this year (2015) and a one-way ticket with on a seat with included breakfast is worth USD 100. The trip lasts from 9.30AM to 7PM. Again, the following is cited for example, and not an endorsement. Not the answer you're looking for? Browse other questions tagged usa canada overland greyhound nova-scotia or ask your own question. How to go from Maine to Canada by bus without going though Boston?